Time for another round of Yvo’s Shorties! Sadly this time around books which had beautiful covers, but the content didn’t match the outside. 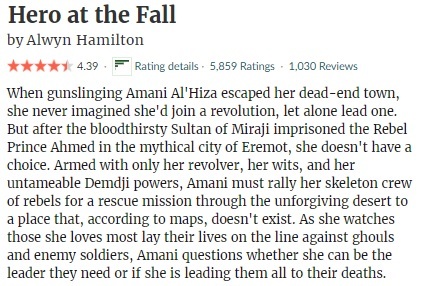 A first and last in a series as well… Hero At The Fall by Alwyn Hamilton was one of my most anticipated releases, but it was nowhere near as good as the first two books. Half Bad by Sally Green I’ve been meaning to pick up for ages, but unfortunately mostly turned out to be a disappointment. I’ve had this series on my TBR for a long time, but somehow I never actually picked up my copy. Things changed when I was able to get beautiful physical copies of the first two books in Dutch during our Europe trip, and when I needed a foiled book for the readathon I grabbed my chance to finally start this series. I’ve heard mixed things about it over the years, and I can understand why now. I initially started reading Half Bad in Dutch, wanting to savour seeing that cover waiting for me near my reading chair. I have to say, I struggled a lot. First I thought it was the language, but I decided to switch to my English kindle version halfway through and I can confirm it wasn’t. There is just something about the writing style in Half Bad that really got on my nerves. There are a lot of short and halted sentences I just couldn’t grow used to, although I admit the writing style as a whole sadly just didn’t work for me. I struggled to keep reading as some parts of the story dragged, and I have to say that for a story this promising the plot kind of lacked action and more filling out in general. And then I’m not even talking about the main character, who is very very hard to like. I like the idea behind this book, the fact that there are two kinds of witches and the main character being mixed turns him into an outcast. The worldbuilding itself has potential as well, but lacked fleshing out for me. 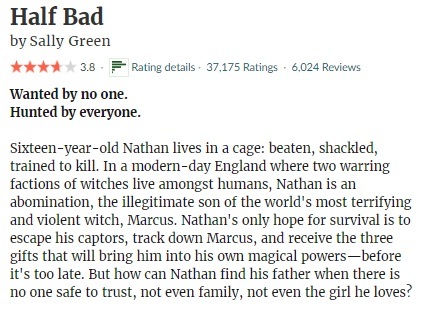 The whole star-crossed lovers angle bothered me as well… And unfortunately I wasn’t able to enjoy my experience with Half Bad. Which is a bummer, because I have a physical copy of the sequel as well… Oh well, at least they look pretty on my shelves. I’m currently reading three more titles for the N.E.W.T. 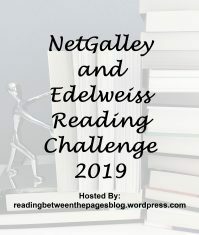 readathon… The first is a pending ARC due soon: The Girl Made Of Clay by Nicole Meier. It’s still early days, but it seems to be a fast read. 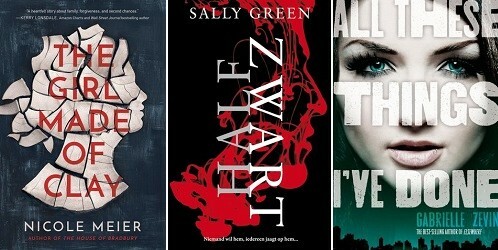 I also started another physical copy and a Dutch translation of Half Bad by Sally Green. I’ve been meaning to read this series for years, so the N.E.W.T.s were a good excuse to finally do so. I have a feeling I would enjoy the story better reading it in English on my kindle, but I also know I really need the practise. 😉 I also started All These Things I’ve Done by Gabrielle Zevin before I realized I needed to read the ARC first. It doesn’t happen often that I have such an instant dislike of a character, but Isadora pretty much does the trick. What a whiny, annoying, self-centered, arrogant and disrespectful brat! Basically, she managed to enrage me on every single page, and I had to work hard on my breathing techniques to prevent myself from throwing my kindle against the wall. And no, sadly I’m not exaggerating here. 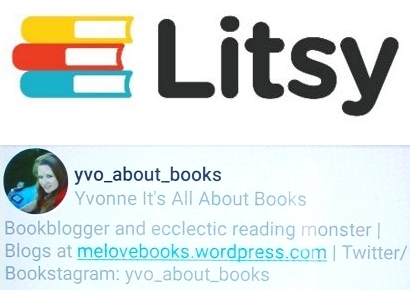 Add a case of insta-love and a couple of other YA cliches and you have the gist of what happens in The Chaos Of Stars… I’m adding an extra star just for the occasional appearance of the Egyptian mythology elements the story promised. If you are looking for a detective thriller series that keeps delivering, a plot that will keep you guessing until the very end or simply a very engaging and absorbing read, you will find all those things are covered in every single Detective Kay Hunter book. Gone To Ground is no exception and has exactly the same high quality I have become used to. I liked spending more time with my favorite team and while the case they investigate took some time to start rolling, the ending left me completely shocked. I definitely didn’t see that coming! Yet another detective thriller winner and without doubt worth the read. I have been meaning to pick up another of Barry Lyga‘s books for ages. The Jasper Dent series is one of my absolute favorites and I had high hopes for Bang, but sadly it wasn’t as good as I hoped. The topic itself is really important, but I felt it was pushed mostly into the background as there was more focus on the whole pizza baking and contemporary romance in general. Not that this is necessarily a bad thing, since I’m a huge foodie myself, but the story fell rather flat for me. This was one of my most anticipated releases, as I loved the first two books and was dying to find out how things would end. It might have been that it has been too long since I read the first two books and didn’t remember all the details, but the fact is that I can’t say I actually enjoyed Hero At The Fall. Amani really annoyed me, with her whole ‘I’m not worthy’ and negative attitude in general. I admire the author for not being afraid to kill of characters George R.R. Martin style, but I do feel some of the deaths were unnecessary and didn’t add anything to the plot. The plot and pace itself were rather slow, and overall I had a hard time keeping myself invested into the story. Such a shame the series had to end this way for me! I’m going to pick up The Ballroom by Anna Hope next as I’m trying to pass all Hogwarts subjects with at least an Acceptable grade… Afterwards I’ll probably read The Shattered Mountain by Rae Carson first since it’s a novella. Then comes Lies Between Us by Ronnie Turner, which I have been really excited about. I also plan to read Norse Mythology by Neil Gaiman soon. 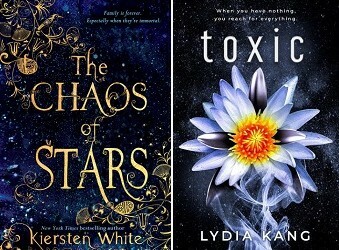 I’m currently reading The Chaos Of Stars by Kiersten White, which doesn’t only have a gorgeous cover, but is also written by an author I’ve been really excited about to read more of. I’m also starting Toxic by Lydia Kang soon, which has to be one of the most gorgeous covers I’ve seen so far this year. It’s a new sci-fi story coming out in November and not my typical genre, but I’m keeping fingers and toes crossed I’ll enjoy it. I personally wasn’t a fan of the Swedish POV especially in the first half of the book, although I did grow to like Holger Two. Things also improved in the second half as the different storylines merged and the story started to flow better. Still, it was hard to connect to some of the characters and the story did drag considerably at points. It was nice to see how everything did fit together and how small their worlds ended up being, although I don’t think it was exactly credible. I’m not sure if it was the original hype around I Let You Go making me set my expectations too high or this being unpopular opinion time again, but sadly I didn’t end up having the reading experience I was expecting. The biggest obstacle was the fact that I guessed the big reveal really early on… It was just too easy to figure out the key information after the initial surprise was revealed, and this was quite a let down for me. I also had problems with the two leading detectives of the case; I couldn’t warm up to them and I always hate cheating main characters. I still can’t believe how much I enjoyed this story despite a love triangle and the presence of a vampire! There is just something about the writing style that draws you right in and makes you fly through the pages. I literally finished this story in one sitting. Highly entertaining, addictive and just enough magic and supernatural atmosphere to keep that delicate balance with the romance elements. Poems From The Cat Uprising is divided in parts, each related to a different step of the ‘uprising’. There are many many cat photos to enjoy, most of them related to the text or poems, some funny and others simply beautiful. I would have liked to see more ‘cat’ perspective in the poems, but I still had a blast reading this title. There are definitely a few very funny moments included inClaw The System, a dry and sarcastic kind of humor I personally really appreciate. While I like the simplicity of the cover, I don’t think the same style works as well for the picture book itself. I personally found the illustrations too simple and bare; there is a lot of white on some of the pages and I don’t think it will be all that attractive for children. As for the story: the idea behind The Lying King is clever and it has a strong moral message. Still, I don’t think that children will actually be able to pick up on that message from reading this story. I felt that it was told in a too ‘adult’ way to be able to actually work as a way to teach children not to lie. The Seven Husbands Of Evelyn Hugo had me hook, line and sinker. Not only was I impressed by the writing style right from the very first page, it was the story itself that fascinated me as well. The idea of the biography, the aged actress finally revealing all about her past… Everything just clicked for me. The character development in The Seven Husbands Of Evelyn Hugo is simply sublime. I never imagined enjoying this book so much, but this is one of those books that you just HAVE to try even if you aren’t sure the genre would be for you. Trust me, you will regret it if you don’t. I never got used to the writing style or tone, which of course made it harder to connect to the story. Secondly, I had a huge problem with Piper Kerman herself. She comes over as someone mostly self-centered, who sees herself as someone above the rest and doesn’t seem to want to admit what she did back in 1993 was wrong. Reading about her views on the prison world made me cringe at points, and while it was interesting to learn more about some of the inmates, I felt it lacked coherence and the story just didn’t flow for me. I have really enjoyed Carol Wyer’s books so far, so of course I had to try out her new detective series so far. The writing is just as strong as ever and the case is both intriguing and chills you to the bone… But sadly I wasn’t able to connect to the new detective or most of her team as all. Instead of refreshing, I found her mostly cliche and I really hate cheating characters. I am willing to give her a second chance though, mostly because the writing, plot development and suspense is spot on. I know Christmas is still far away, but I just HAD to request a copy of this one when I saw it on NG a while back. There was something about the illustrations that caught my eye, and I’m definitely glad my request was granted. What a delightful Christmas-themed story! This is perfect for the middle grade target group, with an interesting plot, a relatable main character they can see themselves in and just enough action to keep them invested in the story. I didn’t realize before this was the third book of a series, but I was still able to enjoy this story to the fullest. Of course all my next reads are N.E.W.T. 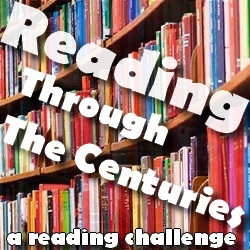 titles as well… Basically, I’m only reading books that fit the readathon prompts this month. These next four are all an attempt of getting all those Acceptable grades in and basically passing all Hogwarts subjects like a true Ravenclaw and with my inner Hermione speaking. 😉 First up is Gone To Ground by Rachel Amphlett, which I’m sure will be yet another winner to what has been a fantastic series so far. I also want to read both All The Things I’ve Done by Gabrielle Zevin and The Ballroom by Anna Hope, which have don’t seem all that known. 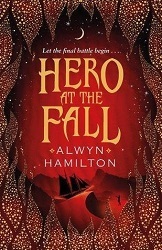 And of course, I’m dying to finally pick up the third book of a new favorite series of mine: Hero At The Fall by Alwyn Hamilton. I had heard a lot of great things about the first Rebel Of The Sands book, so when I saw a copy of the sequel at Netgalley I decided to go ahead and request it. When (to my surprise) the request was approved, I hurried to read the first book. And it was love at first chapter. Both the writing style, plot and characters managed to convince me right from the beginning, and I had an excellent time reading the first book. 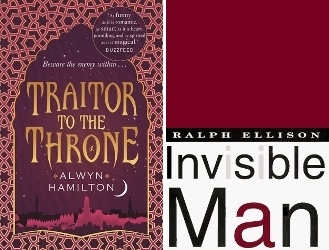 I was more than excited about Traitor To The Throne after that, and Alwyn Hamilton didn’t disappoint. This has without doubt become one of my new favorite fantasy series! Traitor To The Throne by no means suffers from the so-called ‘weak-second-book’ syndrome and was possibly even better than the first book. 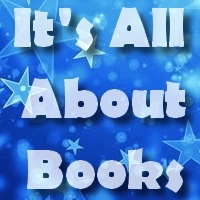 The writing, the worldbuilding, the plot, the characters, the magic… Everything just works. The sequel has a lot less desert and is mostly set inside the palace, but I personally liked the change of scenery. And despite the fact that the story doesn’t end in that big of a cliffhanger, it is going to be a long wait for the third book… Because I sure will be missing the main characters and their world in the mean time. If you like the genre, I can definitely recommend this series! Nearly a year has passed since that memorable day in Fahali… Amani has had time to get used to her powers during the months that passed, and both her reputation as the Blue-Eyed Bandit and the Rebel Prince’s message have spread across the desert. Things are getting out of control, and Amani will soon find herself in a very complicated situation. One day, she finds herself stripped of her powers and identity, and Amani will have to rely on her desert instincts again to survive… Because the Sultan’s palace is a dangerous place. What will happen to Amani and the other rebels? When I start reading a new fantasy series, I’m always looking for a few key elements before I decide to continue with the sequel. The most important ones are: well written prose, excellent worldbuilding, interesting/likeable characters with a believable development and a little something extra that makes the story stand out from the rest. Rebel Of The Sands basically has it all, and the sequel is just as good as the first book. Amani is partly your typical strong female heroine, but I’ve grown to love her character and I like that she isn’t just a strong desert girl with great weapon skills, but also has her ‘special’ powers. I will definitely be looking forward to the third book next year! Dear Rebel Of The Sands, why have I managed to ignore you for nearly a year?! I’m still kicking myself for not picking up this first book of a fantastic new YA fantasy series… But I guess it does mean I can read the sequel straight away! I admit I have heard mixed things about this story in the past, and that might just be why I was so hesitant to pick it up in the first place. I normally tend to have bad luck with popular books, but I’m glad that Rebel Of The Sands has proven to be an exception. I’m glad I finally gave this story a chance and I loved even better than expected! 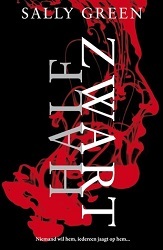 I’ve basically fallen in love with the worldbuilding, characters and writing style from the beginning… Alwyn Hamilton writes in a way that draws you right in and even though the whole strong-female-character thing in YA fantasy isn’t all that original, I was thoroughly charmed by Amani anyway. Together with Jin, Shazad and many other characters she managed to win over my heart and I had a blast following them on their journey through the desert. The worldbuilding is so interesting! I’ve heard complains about the ‘mythical’ being lost by the ‘western’ feel of the descriptions and some of the scenes, but I personally really liked the mix of two different elements. Great prose and characters, interesting plot and worldbuilding, lots of action, a healthy dose of action and magic: Rebel Of The Sands has all the ingredients to enchant you. Amani Al’Hiza lives in the small desert town of Dustwalk and basically learned to shoot like an expert when she was only a little girl. There is not much to do in Dustwalk and Amani has become a gifted gunslinger with perfect aim… But that won’t help her escape before she either loses her freedom or her life. When another bad decision brings her to a shooting contest, she meets the mysterious foreigner Jin. Amani sees him as the perfect escape route, although it won’t be easy to escape with both their lives… And she definitely didn’t imagine escaping riding a mythical horse she didn’t know still existed. And she will soon learn a whole lot more about her country as they try to find their way to safety. Thank you Traitor To The Throne for finally making me read the first book! I’m so glad I was approved for an ARC of the sequel, because I still feel I have been missing out by not reading Rebel Of The Sands sooner. I know this story has a lot of mixed reviews, but if you ask me it’s definitely worth the try. This series has the perfect combination of interesting worldbuilding, great characters and well written prose; the magic and mythical elements make Rebel Of The Sands into something special. I will be looking forward to read more about Amani and Jin’s adventures for sure! * The first book I finished since last week is Little Girl Lost by Carol Wyer, a new detective series I requested after hearing a lot of great things about it. It’s definitely a worthy psychological thriller! Lots and lots of plot twists and the writing style is really enjoyable… I wasn’t a fan of all the characters and there were a couple of cliches, but the rest of this messed up story makes up for it. And even though I saw part of the ending already coming, a couple of facts/twists will definitely surprise you! * I then read Rebel Of The Sands by Alwyn Hamilton, a book I’ve been posponing for way too long if you ask me. I finally picked it up after receiving an ARC of the sequel, and I’m glad I finally gave this story a chance. I loved it even better than expected! I’ve fallen in love with the worldbuilding, characters and writing style and I’m already reading the sequel right now. * The last book I finished was The Five Stages Of Andrew Brawley by Shaun David Hutchinson. I’ve been posponing this TBR jar pick for way too long and I’m glad I finally gave it a go. I still have to read the previous TBR jar pick as well (Little Women), so I won’t be picking a new one until I do. This one was better than expected even though some of the story was a bit weird (especially the whole Death thing and Andrew himself). 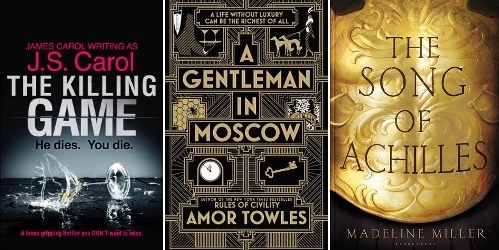 The story is without doubt original and I liked the graphic novel bits with patient F.
I have two pending ARCs next: A Gentleman In Moscow by Amor Towles and The Last Gods of Indochine by Samuel Ferrer. (Ok, actually I have a whole mountain of pending ARCs, but I’m going to try and read these two first…) I also want to read both The Song Of Achilles by Madeline Miller and Never Fade by Alexandra Bracken VERY soon. So many books and so little time!